The graphic intensity of Orson Welles' black-and-white 1948 film of Macbeth, then, isn't merely for show, but a carefully considered symbolist staging for screen, meant to complement the Bard's immortal poetry. 107 min. Republic Pictures. Director: Orson Welles. Cast: Orson Welles, Jeanette Nolan, Dan O'Herlihy, Alan Napier. In his heavily symbolist tragedy Macbeth, William Shakespeare consistently describes the interplay of darkness and light, of darkness as death, murder and other "dark" deeds, and of light as life, righteous justice, and truth, shining into the corners where evil lurks. The graphic intensity of Orson Welles' black-and-white 1948 film of Macbeth, then, isn't merely for show, but a carefully considered symbolist staging for screen, meant to complement the Bard's immortal poetry. Shadows and fog compete with fire and torches, in keeping with lines like Lady Macbeth's "Come thick night/And pall thee in the dunnest smoke of hell,/That my keen knife see not the wound it makes,/Nor heaven peep through the blanket of the dark,/To cry, 'Hold, hold!'" Similarly, Welles places the action in a surrealist landscape (anticipating later films, like The Trial, and sequences, like the climax of Touch of Evil) that likewise reflects Macbeth's own self-aware horror. "I had else been perfect," Macbeth laments, "Whole as the marble, founded as the rock,/As broad and general as the casing air. But now I am cabined cribbed, confined, bound in/To saucy doubts and fears..." As he says these words, the film has moved, for the first time, to an interior, such as it is: a cavern to contrast the "blasted heath" that here seems to extend from where the witches are famously found all the way through King Duncan's castle of Forres. That castle is hewn from craggy rock, surrounded by an imposing big-sky backdrop, an ill wind ever blowing. The open-air treatment of the palace scenes emphasizes Macbeth's fear of exposure, and that castle set, like the text, emphasizes height (the destination of "vaulting ambition") and the certainty of tragic falls. In a suitably Shakesperean flourish, Welles also pits the symbolically chaotic, primitive pagan against the symbolically orderly, civilized Christian, adding another layer of social tension to an already fraught civilization-in-peril scenario. All of this is to say that Welles' Macbeth, while not at first blush a terribly accessible film in 2016, rewards scrutiny: the more one looks and listens, the more one sees and hears. In this way, Welles again proves in sync with his literary hero, for the unfolding text has riches deeper than its many famous lines. The shortest and most visual of Shakespeare's tragedies, Macbeth uniquely lends itself to cinematic adaptation: witches' brew, a prophecy of coronation, a phantom dagger, direful murder, blood that won't wash away, and the ghost who came to dinner. Welles lends the material his own distinctive visual style, marked here by stark high and low angles and prominently employed depth of field. Welles also intensifies the play's penetrating psychology by choosing close-ups as his default composition, makes strong use of montage for the witches' incantation at the film's outset, conversely (and masterfully) stages a then-unusual ten-minute-long take around the discovery of Duncan's murder, and gets an uncanny effect from slow motion during the march of Birnam Wood. Of course, Welles' Macbeth has also been famously divisive, having been mockingly dismissed by most upon its premiere (only a week on from Olivier's celebrated, conventional Hamlet) for Welles' bold choice to have the entire cast perform the play in a setting-appropriate Scottish brogue, for the outré costume choices (basically, Macbeth's boxy, spiky crowns), and other "crimes" of mise en scène. The reception confirmed Republic Pictures' worst fears, and the studio insisted Welles cut the film (which he did, by 23 minutes) and accept the re-recording of dialogue. But time will out. Yes, the film tends toward an old-school declamatory style of Shakespeare acting, with the Macbeth power couple often adopting slow and zombified readings that can grow wearisome. Yes, the film seems to get off to something of a poky start (but every Shakespeare piece requires a period of adjusting one's ears). But, yes, it's also a film that only seems to grow in one's estimation the more time one spends with it. If Welles' Macbeth lacks somehow for propulsion, it makes up ground in atmosphere and performance, particularly that of Welles himself in the title role. The character's early bemusement darkens soon enough: Welles plays Macbeth, once crowned, as a man infected, poisoned, drunk with power. At the film's outset, the piece plays as spooky but not very personable, but once the film turns the corner of Macbeth's tyranny, it gets a charge of megalomaniacal performance energy that enlivens the other performances as well. Jeanette Nolan makes an entirely serviceable, if not particularly memorable Lady Macbeth, and an ensemble that includes Dan O'Herlihy (Macduff), Roddy McDowell (Malcolm) and Alan Napier (in Welles' invented composite role of A Holy Father) provides sterling support (the cast had tried out the show with Welles the same year in Salt Lake City). That said, it's Welles' show, and he turns in effective performances of each well-known monologue and soliloquy. Welles also innovated by at times turning monologue—sometimes partially, sometimes wholly—into internal monologue by use of voice-over layered onto close-up. It's a sensible cinematic device, one of so many that make Welles' Macbeth a stylish, well-considered, and intellectually generous screen experiment. For its "Olive Signature" Blu-ray special edition of Orson Welles' Macbeth, Olive presents the feature in its "1948 Version" (1:47:14, HD) and "1950 Version" (1:24:56, HD). Both transfers maximize the best available elements culled by and from the UCLA Film & Television Archive, making this likely the definitive release. Some minor print damage is evident in fleeting moments of density-fluctuation spottiness, but on the whole, the film has never looked better or sharper. Perfectly calibrated contrast anchors the black-and-white image, and film grain looks wholesome, with revelatory detail and texture. With a lossless DTS-HD Master Audio 2.0 mix, Olive also maximizes the source audio for a definitive, clean, clear presentation. Disc One houses the 1948 version and a fantastic audio commentary with Welles biographer Joseph McBride. The critic, friend of Welles, and author of three books on the writer-director-star discusses all aspects of the production's planning, production, and history. He supplements his own knowledge by reading in primary documents and notes, including Welles' editing notes on the recut, reviews, Christopher Welles' recollections of her father and being in the film, and some Shakespearean criticism relevant to Welles' choices. It's a very personable track, in which McBride also mentions in passing his own daughter's role in a school production of Macbeth. Disc Two holds the 1950 Version and the lion's share of bonus features, which mostly consist of new video interviews. "Welles and Shakespeare" (11:56, HD) allows Professor Michael Anderegg, author of Orson Welles, Shakespeare and Popular Culture, to provide a brief history of all intersections of Welles and the Bard. 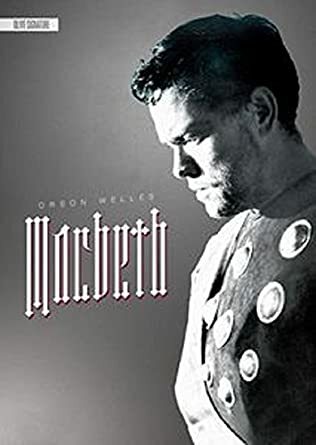 Anderegg efficiently covers the films Macbeth, Othello, and Chimes at Midnight, as well as Welles' theatrical Shakespeare productions, including the famous "voodoo Macbeth" and his ambitious adaptation Five Kings. "Adapting Shakespeare on Film" (8:19, HD) intriguingly (and separately) sits down two filmmakers whose careers brush with Macbeth or Shakespeare: directors Carlo Carlei (the most recent and most lamentable Romeo and Juliet) and Billy Morrissette (Scotland, PA). Though the chats can come off as oddly self-serving, it's interesting to hear these two reflect on Welles and Shakespeare. "We Walk Again" (7:14, HD) is identified as an excerpt (though what's cut is seamlessly excised) from the 1937 WPA documentary. It's here as it contains the only extant film footage (including sound) of Orson Welles' Federal Theatre Project production of Macbeth (the "voodoo Macbeth"). "That Was Orson Welles" (9:49, HD) presents actor/writer/director and Welles confidant Peter Bogdanovich, who rambles engagingly about knowing Welles and working with him in Los Angeles, including the interviews that led to Bogdanovich's book This Is Orson Welles. Bogdanovich's comments touch on Macbeth, but also Welles' greater career and personality. "Restoring Macbeth" (8:22, HD) provides a fascinating look at the history of Macbeth's restoration from film elements, in the form of an interview with former UCLA Film & Television Archive Preservation Officer Robert Gitt. Oddly, Gitt can only speculate (albeit optimistically) as to what additional digital restoration may have been done to the film in the intervening years from when he had his hands on the elements. "Free Republic: Herbert J. Yates and the Story of Republic Pictures" (6:35, HD) allows archivist Marc Wanamaker to blitz through the history of Republic Pictures and the production and handling of Welles' Macbeth. "Orson Welles's Macbeths" (10:02, HD) is the text of Jonathan Rosenbaum's essay—the same currently included in an eight-page booklet included in the discs' case—in a slide-show or auto-play format. This is a hugely impressive entry in Olive's new Signature line and a true gift for Wellesians. Surely no film fanatic or Shakespeare aficionado can be without this sterling two-disc set. All site content © 2000-2019 Peter Canavese. Page generated at 04/18/2019 02:03:02AM.